The Yemeni Parliament is set to hold its first session Thursday in Seyoun District of Hadhramout, with the presence of President AbdRabbu Mansour Hadi and envoys of 19 countries. On Tuesday, the Yemeni official government sent letters to the G19 – states sponsoring the peace process in Yemen – asking them to confirm their appearance at the parliament session. Security authorities, backed by the Arab coalition, have provided logistic arrangements, including transportation and accommodation, read the invitation. Saudi Patriot-equipped and Yemeni presidential guard forces arrived Saturday in Seyoun to secure the session, the first since 2015. Parliament sources confirmed that 140 MPs, 90 of whom in Riyadh and 50 in Yemeni provinces, would attend the session, according to the Saudi Okadh paper. According to the sources, the first session will start with speeches, by President Hadi and heads of blocks, followed by speakership vote. Okadh quoted MP Mohamed al-Hazmi as saying that the Parliament is seeking to activate state institutions, approve the budget, practice control and accountability on government, and tell the international community that Yemenis' representatives stand by legitimacy against coup. 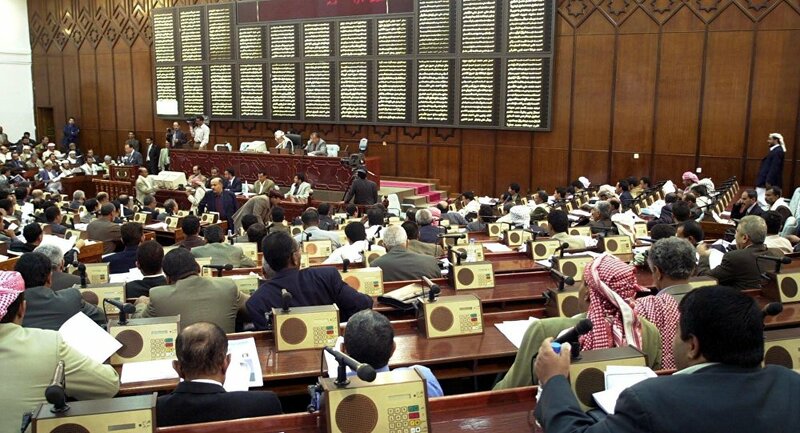 The Yemeni Parliament consists of 301 seats in total, including 34 vacant seats and 127 MPs living in Sana'a. The Houthi group has said the session aims to legitimize Arab coalition and its operations. "America seeks to acquit itself from aggression crimes against Yemen by holding Saudi Arabia and Emirates fully responsible for them, and the latter aim to hold traitors and agents responsible for such consequences," Houthi information minister Dhaifullah al-Shami tweeted. "The derive behind holding a session in the name of representatives is but to achieve that" aim. "Here the traitors will hammer the final nail in their coffin," he threatened signaling at their own properties. These developments come as the Houthi group preparing for by-election in the rebel-held capital of Sana'a to replace the Parliament vacant seats. The Houthi-run Supreme Committee for Election and Referendum has called on electors of 34 constituencies to attend ballot boxes on 13 April and choose their representatives.